Long ago King Xithius had 2 sons and bestowed upon the youngest, Xanthian,the reigns of the kingdom, while the eldest Ganthian held a revolt against his brother. Evil turned Ganthian and his followers into trolls and they were cast out far away from the kingdom. Years later the Ganthites return to capture and kidnap a decendant of Xanthian, Xabian. Xabian was born with a hole in his heart and required special gems near him at all times to mend his heart. His friend Jenevieve falls into a coma when Xabian is kidnapped and is able then to have her spirit visit him in the trolls care. She is able to bring him gems to heal his heart. Xabian being from the kingdom of kindness is able to show the trolls kindness and love, something they have not experienced. The golden rule is the theme of this novel, Treat others how you would like to be treated. I would say this book is geared for the tween age group who enjoy fantasy fiction. There is nothing problematic with the book, nicely written and positive ending. Youngsters just venturing into the world of fantasy would do well with this novel to ‘get their feet wet’ in some of the imaginary creatures and elements in fantasy. I did struggle a bit with the time flow of the book as the prince left when he was 12, and when he returned he was quite a bit older and I hadn’t caught on that years and years had passed. The drawings by BC Hailes definitely adds a charm to the novel, helping the reader to picture the story as it unfolds. I received a copy of this book from Media Guests in exchange for an honest review. ABOUT THE AUTHOR: Jeanette Clinger Hurley is an accomplished world-class singer, songwriter, story teller, Entrepreneur and lifelong dreamer. As a child she performed with luminaries such as Bob Hope, Liberace, Sammy Davis Jr. and Gene Kelly to name just a few. In the 90′s, Jeanette fronted and recorded with the best selling jazz contemporary artist Hiroshima, as well as recording and touring with Yanni and many others. She’s written, Produced and recorded several CD’s of her own with abundant success. 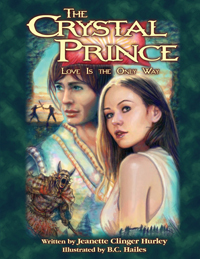 The Crystal Prince marks her first foray into children’s literature and her decade of passion and persistence have finally come to fruition in the book you now hold in your hand. Jeanette is a loving wife and proud mother to Logan and London, who are her greatest and proudest accomplishments to date. We help our clients realize the effectiveness and power of online book promotions.